Mount Vernon is one of 84 local historic districts in Baltimore City. The Commission for Historical and Architectural Preservation (CHAP) works with the MVBA to continually monitor, approve, and lead the charge to preserve the historically significant structures that contribute to the local historic district designation. Designation helps to protect and celebrate the neighborhood’s rich history. It also provides an effective and transparent design review process that preserves the neighborhood’s historic character. The Boundaries of the Local Historic District can be a bit tricky. The general boundaries of the district are as follows: Hamilton Street to the South, Howard Street to the West, Mount Royal Avenue to the North, and Guilford Avenue to the East. The Federal Historic District looks more specifically to the blocks immediately surrounding the historic parks of Mount Vernon Place and the Washington Monument. The Boundaries of the Federal Historic District are pretty straight forward. The general boundaries of the district are as follows: Hamilton Street to the South, Ploy Street to the West, Read Street to the North, and Hargrove Street to the East. Mount Vernon is one of the four neighboring communities that are combined to form the Midtown Community Benefits District. The four neighborhoods that comprise the Midtown Community Benefits District, Bolton Hill, Charles North, Madison Park, and Mount Vernon, are at the “geographic heart” of Baltimore. 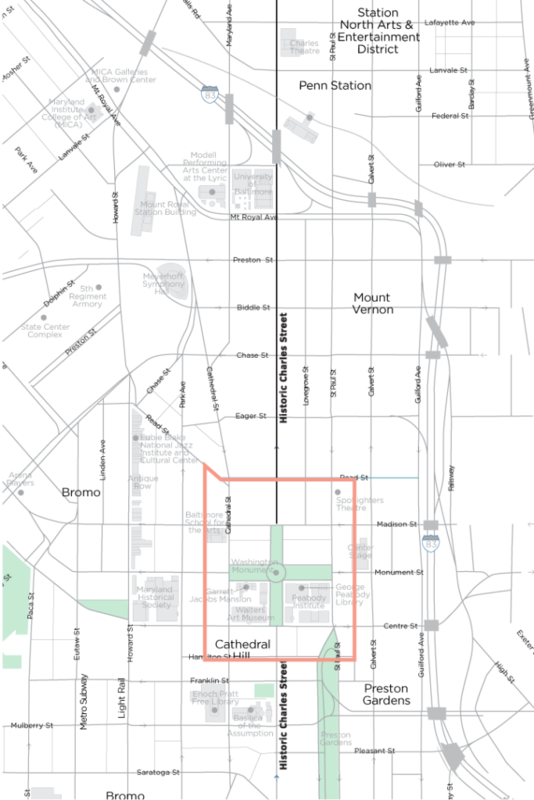 The boundaries of the Midtown Benefits District generally range from Tiffany and Tyson Streets to the West, Franklin and Centre Streets to the South, I-83 and Calvert Street to the East, and North Avenue to the North. Downtown Partnership is generally located to the South of Mount Vernon. However, there are a few pockets in the neighborhood that are actually part of the Downtown Partnership instead of the Midtown Community Benefits District. 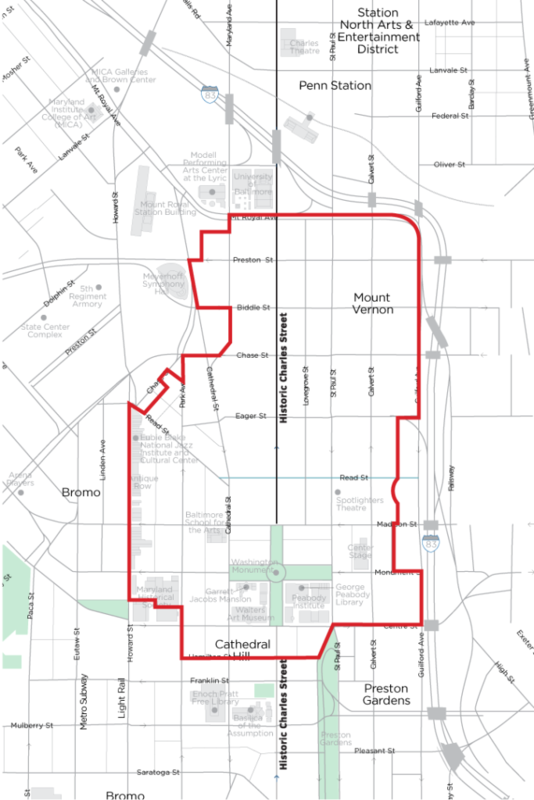 The boundaries of Downtown Partnership that impact Mount Vernon are as follows: Centre and Franklin Streets to the North, and Tyson & Read Streets as well as MLK Boulevard to the West. Charles Street, one of the oldest thoroughfares in America, has roots that predate Baltimore itself. Before Europeans settled around the Chesapeake Bay, it is speculated that a Susquehannock Indian trail ran along what is now part of Charles Street. When Baltimore Town was laid out by Maryland’s colonial legislature in 1729, the then-unnamed street passed by the existing farm home of John Fleming, near the present-day Charles and Lombard intersection. Briefly known as Forest (or Forrest), the road was being referred to as Charles Street by at least 1761. The boundaries of Historic Charles Street Association are generally speaking one block East and one block West of Charles Street, Lombard Street to the South, and 20th Street to the North.